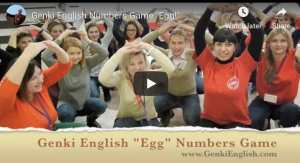 You’re going to *love* teaching Genki English! To get you up and running here is your extra special video training. Grab a coffee, grab a notebook, we’ll start with the “behind the scenes” and then you’ll get to see it in action with real students. 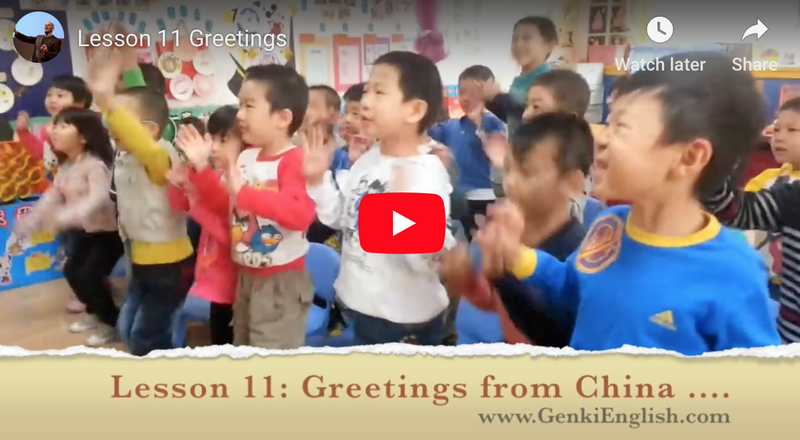 Genki English teachers have taught thousands of kids and adults in many different countries all over the world, so let’s learn how to do it in the videos below! And then where to find all the bonus VIP flashcards/minicards etc. …. and on this page you have all the games, discipline ebooks and workbooks! Then let’s see it in practice with real people …..
Gets the kids genki. Says “This is fun.” “This is something different”. Get the kids to respond quickly to your actions so you can control things if they get too genki. Review, review and review like crazy. It’s not “what you’ve done in class”, it’s “what the kids can actually do”If you can’t see Youtube videos on your school computer, there’s also a low-resolution version available. The first rule of Genki English: Confidence is the key, if you think you can, you can! Get the kids doing activities amongst themselves as soon as possible. Then if you have time, do the Lines Quiz. Gets the kids used to answering questions straight away. Go straight to using a song without any drilling of language. Saves a lot of time. Always include actions, cute pictures, melody, as many senses as possible to maximise chances of remembering each word. Teach what students want to be able to say, not what you want to teach. Keep the happy, funky, cool stuff for the end. End on a high note. Teach one question + around 8 answers per lesson. A game for a game’s sake is no good. Every game is there to practise the English in a fun way. Be as genki as you can when teaching the song, then get the kids doing the game as quickly as possible so you can get on with preparing the next stuff. Include the previous lessons’ English in the current game. No lesson is in isolation. Use a stopwatch to add excitement. Ask the kids if they can make the time limits or not. If they think they can, they can! Finish off with a happy ending. How old are you? with Mingle for lower grades. The kids ask “How old are you?” and you answer with the age. They get in to groups of that number. Say “I’m sorry?” several times so they ask again louder. There are more details on this lesson here. This video is the first part of lesson 2 of the curriculum. And also remember I’ve taught this lesson to thousands and thousands of kids, so don’t expect it to be so smooth on your first go. Just smile, go in there expecting lots of fun and you’ll have a great time! And throughout the site and lesson plans you’re going to see many more videos of teachers from around the world doing the different activites, songs and games. And of course all the materials, software, songs, access to the flashcards to teach these lessons are now in the full downloadable Teacher’s Set.